As we sort of expected, Notre Dame’s Oct. 21 home game versus the University of Southern California produced another new high-water mark for the new Wi-Fi network at Notre Dame Stadium, with 7 terabytes of Wi-Fi traffic seen during the event, according to Notre Dame network officials. 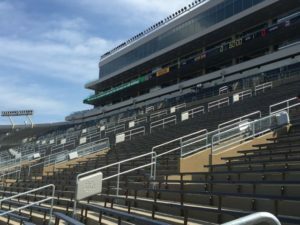 The new network, part of the Campus Crossing remodel of the classic on-campus venue, has been humming all season, starting with a 6.2 TB night on Sept. 9, when the Fighting Irish hosted Georgia. With historical rival USC in the house, however, Notre Dame fans set new records across the board for Wi-Fi use, including most unique clients (27,399), most concurrently connected clients (21,008) and most peak throughput, 5 Gbps. It probably didn’t hurt that Notre Dame crushed the Trojans that day by a 49-14 score, which probably made it into many selfies with the scoreboard in the background. The 7.0 TB mark puts the Notre Dame-USC game into the No. 5 spot on our unofficial all-time list of single-day Wi-Fi data usage totals, behind just Super Bowls and some recent big-game NFL events. It also gives Notre Dame the No. 1 and No. 2 marks when it comes to collegiate events, at least for now (we’ll be on the lookout for the College Football Playoff championship game this season at Atlanta’s new Mercedes-Benz Stadium). 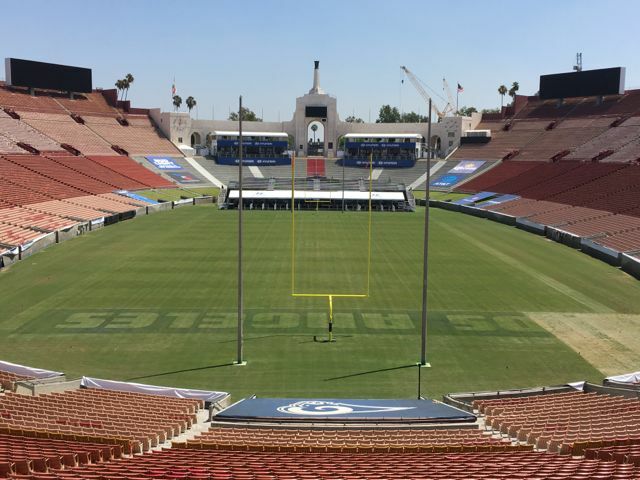 Previously reliant solely on DAS coverage, the Los Angeles Coliseum added Wi-Fi coverage last November in the student section – about 7,500 seats on the bowl’s east side – thanks to a donation of equipment and labor by Mobilitie. The wireless services provider is also in the process of adding Wi-Fi to two sets of club suites — behind the southern end-zone and on the deck of the Coliseum’s iconic peristyle. These are used by fans of the Los Angeles Rams, the recently relocated NFL franchise playing its second season in the City of Angels. The Rams’ new $2.6 billion stadium is under construction in nearby Inglewood, projected to be done in 2019 and ready for the 2020 NFL season. In addition to the Rams, the Coliseum is also home field for the University of Southern California’s football team. It’s also slated to be the stadium for the 2028 Summer Olympics, playing host to the world’s athletes for an unprecedented third time. Editor’s note: This profile is an excerpt from our latest STADIUM TECH REPORT, our Fall 2017 issue that has in-depth profiles of network deployments at Notre Dame Stadium, Colorado State’s new stadium, and the Atlanta Falcons’ new Mercedes-Benz Stadium. DOWNLOAD YOUR FREE COPY of the report today! 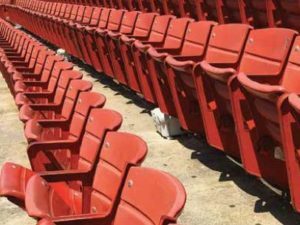 Mobilitie’s generosity notwithstanding, all the fan-facing Wi-Fi at the Coliseum is temporary, according to Derek Thatcher, an IT manager for USC, which manages the Coliseum on behalf of the County of Los Angeles. Demolition at the stadium will get underway in January 2018; while much of the bowl’s structure will remain, permanent club suites will be added as will new seating and new aisles with handrails. That will translate to a reduction in bowl capacity from 94,000 to 77,500, according to USC. The $270 million refresh was already underway before LA’s eleventh-hour entry in the Olympics sweepstakes, activated after Boston voted down a bid. The U.S. Olympic Committee has earmarked $175 million for other upgrades at the Coliseum for the quadrennial gathering of the world’s athletes – and broadcasters. A surprise part of LA’s Olympic bid was a proposal for simultaneous opening ceremonies at two venues, Thatcher explained. Under the USOC’s plan, the visual and logistical extravaganza could be split between the Coliseum and the gleaming new NFL stadium that the Rams will share with the Los Angeles Chargers (formerly of San Diego). Though the Games are more than 10 years away, it’s unclear how the use of two venues would work logistically. But the potential wow factor of such a spectacle is undeniable. In the meantime, Thatcher, many of his USC counterparts and busloads of subcontractors will have their hands full once the current NFL season ends early next year. Fan-facing Wi-Fi is part of the plan for the Coliseum refresh; no word on which vendors are in the running or when the university will award the Wi-Fi contract. The USC Trojan faithful and Rams fans at the Coliseum had been reliant on DAS from AT&T, T-Mobile and Verizon Wireless. But Wi-Fi coverage is envisioned from the gates to the concourses and bowl. The Coliseum Wi-Fi will not extend to adjacent parking lots, which are owned by the State of California, not USC, Thatcher added. And though the equipment and service contract hasn’t been awarded yet, Mobilitie made a smart move with the interim gear it donated – Wi-Fi access points all made by Aruba (now owned by HP Enterprise), the same Wi-Fi gear in use across the rest of USC’s campus. The donated network also gives Mobilitie insight to usage patterns, user habits and engineering challenges that are unique to the venue. The Coliseum’s renovation is projected to be done by August 2019, though the facility will be useable for home games played by both USC and the Rams in the interim, according to Thatcher. 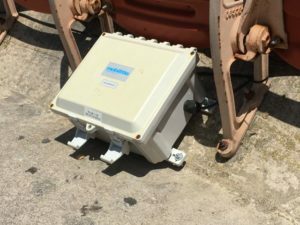 In the meantime, 166 Aruba APs will power fan-facing Wi-Fi at the Coliseum. Mobilitie installed under-seat APs; rather than drill new conduits or use saw-cuts through stadium concrete, the service provider used low-profile rubber matting to conceal the wiring. Many of the APs are also installed on angled concrete, which helps preserve storage space beneath the seats, a plus for fans and their sacks and packs.